And I don’t mean a guy or girl(that kind of girl) or even an earring as the case may be. I mean those lovely items of clothing, footwear, arm candy that just scream rock and roll chic. Studded items are in this season and la tendenza is always in on it. We love this simple and classy look. 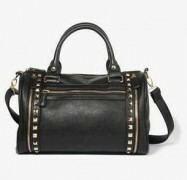 Check out our Bags tab for a similar hand bag. Cover: The Stunning Joan Smalls Fronts Vogue Japan January 2013 By Terry Richardson! And that’s why you know that if it’s trending now, we’ve got it and matter of factly even before it starts trending, we see it and stock it. Apart from looking quite fabulous in the photos, we think the accessories for Beverly Naya’s styling were absolutely on point. Check out the feather earrings and others on our Accessories and others page. Imagine those words coming straight from your bag…lol!!! Very scary, right? Truth is, your bags may have very well ‘spoken’ those words by now by way of the white musky film or patches that we find on our bags from time to time. It’s time to take control, init? – Always let your bags breathe. – Store you bags in the accompanying dust bag and if space permits, stuff your bags with newspaper or other similar paper to help retain the bag shape. -Don’t carry one bag for too long, no matter how much you love the bag. Switch bags as regularly as you can, some ladies switch weekly, I do a switch fortnightly. -Clean your bags properly and ensure they are dry before storing them.